On my path along Danforth Avenue canvassing businesses, homes and greeting constituents, I came across this sheet of paper on the ground. It would seem that only a select few homes and businesses received this notification letter. 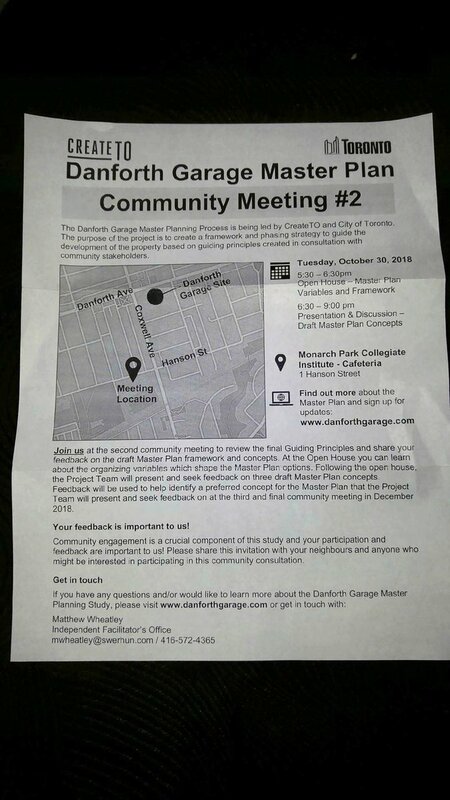 It was not stamped but appeared to be hand delivered to only a few select homes around the Danforth Garage proposed site at Danforth Avenue and Coxwell Avenue. As this notice pertains to the merging of two police stations 55 & 54 Divisions I would think that this information is important to all constituents in Ward 19. In addition, there are many businesses and community organizations that may have wished to have been considered as stakeholders in the site development but were not informed of the potential opportunity. Please attend this Community Meeting #2 if you can and let your City Councillor(s) know how you feel about being not fully informed of the planning process.